Bring the paper you’ve had stashed for years in your flat files and know you will never use. Go home with paper you’re excited to try out. GUIDELINES: this event has a few – just a few – guidelines on how to prepare the paper you’re bringing. PLEASE READ AND FOLLOW. This will make the event run much more smoothly, and make it much more fun for everyone. 1. Pull out all the paper you want to swap. 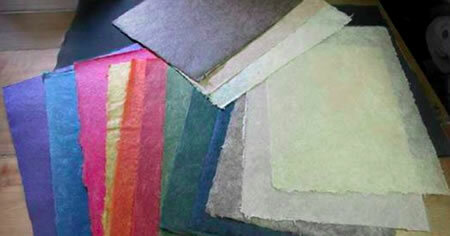 Any kind of artist paper or decorative paper is great. Please do not bring: newsprint, typewriter paper, butcher paper. 2. Grab some Post-it notes and a pen. If you know something about the paper that other artists would want to know, put that info on the Post-It. (e.g., fiber content, sized/unsized, specialized use, if any) Your fellow artists will thank you for doing this. 3. If you have papers that are torn or stained but still could be useful to someone -- a collage artist, for example -- please label each of those sheets “As Is.” If you have cheap sketchbooks you’d like to clear out, those will go in the “As Is” pile as well. We don't want people taking paper they think is perfect and discovering an issue later. 4. If you have partial pads of high-quality paper, please count the sheets and put that number on the cover. 5. Bring them all in! When you arrive, we’ll count up the sheets you’ve brought (other than the “As Is” sheets). You’ll get a card with that number on it. That’s the number of sheets you can take home with you. The more you bring, the more you can take. Please understand that we won’t be sorting paper by value. One sheet in = one sheet out. The “As Is” sheets will go into a separate pile – those will be generally up for grabs. Once we have all the paper out on tables, the fun begins. We’ll ask you to be mindful of the other “shoppers” – if it’s clear that several artists are interested in a given stack of paper, divide the stack. When in doubt, err on the side of generosity. Check or payment must be recieved by Oct 30th to secure a place. Liz Jaff sculptural paper artist and paper preparator at the Guggenheim, will speak about, demonstrate, and answer questions on less commonly known methods of mounting 2D and 3D paper work. TRUNK SHOW with Lauren Sugita of Paper Connection Providence, RI. One of the two leading importers of Japanese art papers in the country, Lauren will speak about the properties of various fibers used in Japanese papers, and bring samples of papers that are not available anywhere else in NYC. You can place orders for papers at the event.